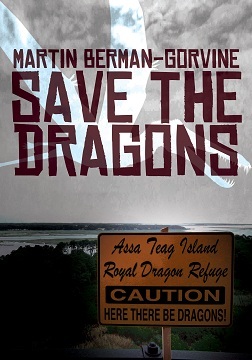 Excerpt from Martin Berman-Gorvine's novel, "Save the Dragons!" Welcome to Gloria's Gateway Books! Step through that gap in the shelves over there, and Gloria, an eleven-dimensional being who is sometimes a woman, sometimes a cat, and always more than she seems, will carry you to a world where dragons and airships soar above the East Coast, America is the home of the British Empire, and the Bonaparte family rules Europe. Check out her collection of impossible books, atlases, LP records, and other artifacts, and then follow our teenage heroes as they strive to save the noble Draco americanus from extinction while fighting the mightiest empire the world has ever known! Buy the paperback via Amazon or the website of the publisher, Wildside Press, or buy the e-book via Amazon or via the Wildside Press website.